Office Desks are a central component in a modern workspace. At Radius Office Furniture we have adjustable sit-stand desks, modern modular workstations, reception counters and unique executive desks. 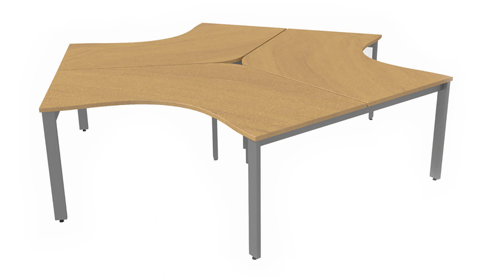 Our desks designs include radial, wave and straight desks that can be arranged to suit the requirements of your space. You can choose office desks that fit into your office design by selecting from up to 16-panel colours and 4 metal paint colours in any combination you want. 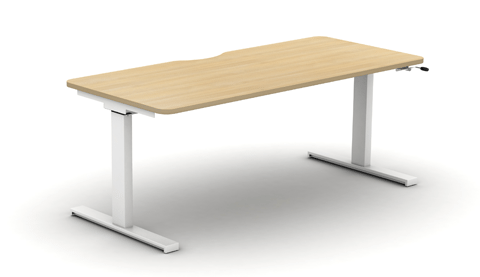 Our desks also have 4 different types of legs, including cantilever, A-line, closed legs, and panels. They come with inbuilt or attachable desk screens, modesty panels and flexible cable management systems. And if you want an even bigger upgrade to your desk, choose from our additional desk accessories, like power modules, cable baskets and spines, CPU holders, monitor arms and desk-mounted screens, for a modern and organised office desk. Do you want a classic design that never goes out fashion? 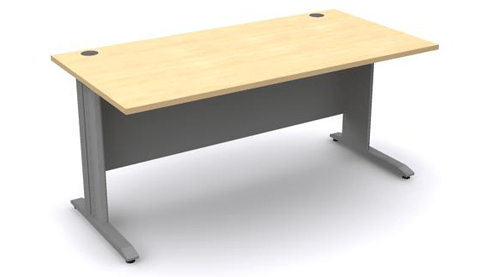 Browse our range of straight desks! For a modern look opt for radial or wave desks with ergonomically designed worktops. Combine technology and well-being with our adjustable desks! Did you know that the ergonomic benefits of a sit-stand desk include a better posture and a decrease in back pain? At Radius Office Furniture we have something for every taste! 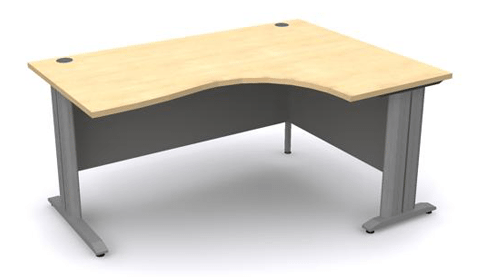 We have solid wood executive desks with finishes of beech, oak or maple, contemporary office desks that combine a stylish design and the latest technology, mobile workstations and reception desks. 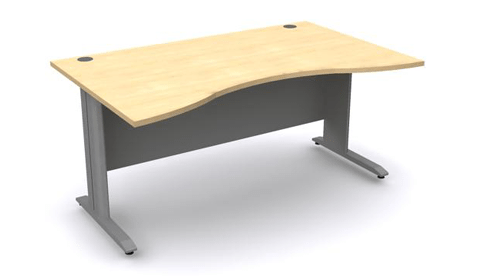 All our desks have impact-resistant edges and scratch resistant surfaces. We guarantee that you are making a great and durable investment! We have something for every budget, whether you’re looking for a cheap corner desk or an ergonomic standing desks. Also, low prices don’t mean low quality! Our office equipment suppliers include some of Europe’s top manufacturers, including Trexus, Sonix, Oplan, Ashford, Quando, Steelcase, Herman Miller, Adroit, Ergotron, Buronomic and more! Browse our website for our full range of office desks. Whether you’re decorating an urban office or looking for some modern home office furniture, we have different options for you! Do you want to decorate a big open-plan office? 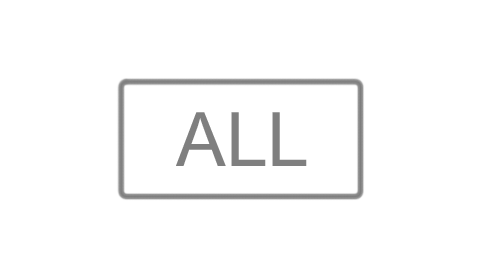 We recommend modular systems. We can create different desk configurations, from back to backbench systems to desk rows of any length. They are perfect if you want to encourage collaboration and teamwork! And they come with inbuilt or detachable modesty panels and desk screens to create a personal space for each employee. 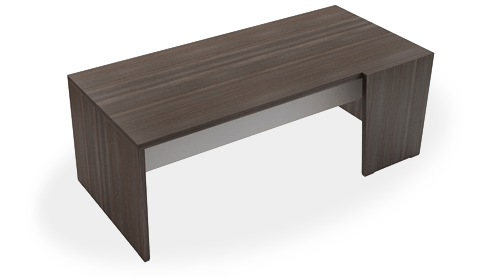 If you’re looking for the perfect home office desk, why not try l-shaped desks or return desks? Their design makes them easy to fit into corners, guaranteeing that you will make the most out of your space. Plus, our return units can be customised into storage units. You can save space through a clever storage system! At Radius Office Furniture we don’t just cover traditional office spaces. We have something for every work environment, no matter how challenging! 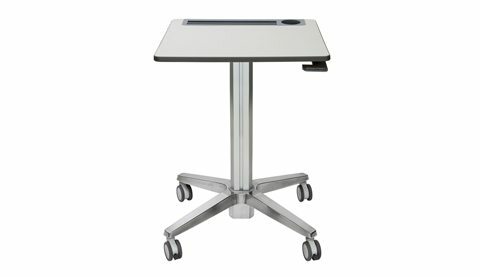 Our sit-stand desks are perfect for both conference rooms and smaller spaces. We also offer mobile workstations – adaptable to different types of work environments and particularly popular among medical professionals. They are easy to move and have an adjustable mechanism that makes them suitable for medical equipment and perfect for the fast-paced environment of a hospital or consultation room. And don’t forget your reception! 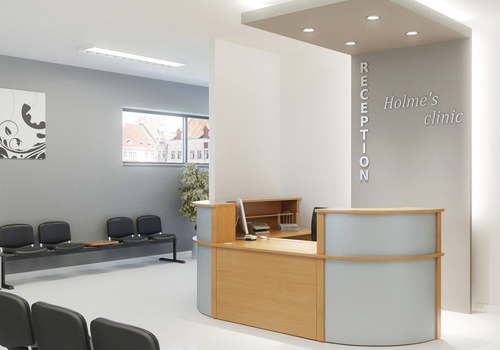 The reception area is the first impression your business makes, so it should reflect your company’s quality. 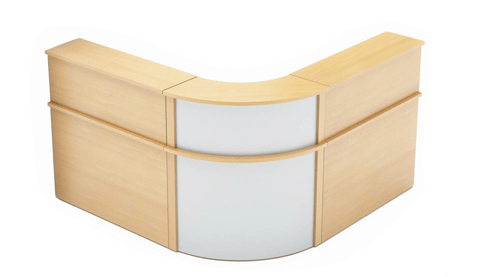 We provide reception counters with a modern design, including 90 degrees corner desks with white, oak, walnut, beech or maple finishes, curved units, and semicircle counters. 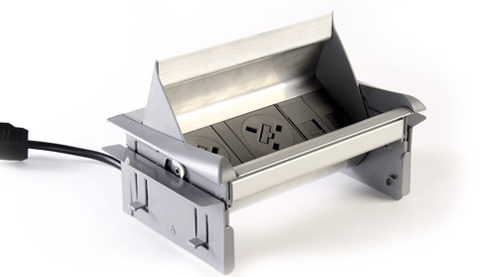 Their additional features include glass tops, desk risers, metal portals for cable management, contrasting panels and LED lights. And if you don’t know where to start, we can give you some modern reception desk ideas! No matter what your needs are, we have a wide range of high-quality office furniture that can be customised accordingly. If you feel overwhelmed by all the option do not hesitate to use our space planning service! The Radius Office Furniture team is here to ensure that you are satisfied with your workspace. We offer delivery and installation across the UK: in England, Scotland, Wales and Northern Ireland. All major cities in the UK are covered, including London, Birmingham, Edinburgh, Cardiff, Manchester, Liverpool, Sheffield, Glasgow and Bristol. It doesn’t matter if you’re situated in the rural Lake District or central London, our installation and delivery service is designed to meet your business requirements. If you’d like to find out more about our range of Office Desks or discuss your requirements, simply request a callback.